Our managed review experts deliver comprehensive legal review globally, from initial project planning to completion of your matter with laser focus on review effectiveness. We drive efficiency at every step ensuring provision of key information early in your case and frequently throughout the review. This enables your teams to defensively manage your matter, deliver quality results and drive cost reduction. Acuity® workflows combine analytic technology and specialized teams required for projects of any magnitude – all in direct collaboration with counsel. We recruit and retain our own review attorneys, including foreign language experts, who are trained on our platform and processes, and a variety of case types ensuring any review can be efficiently executed with confidence. The quicker you can identify relevant data, the sooner you can develop case strategy. Acuity workflows utilize advanced analytics with leading e-discovery review software, including Relativity and Ringtail, to reveal key facts fast with more depth than standard review methodologies. Informed and responsive review strategies can begin within days of implementing a project and can be updated daily as new insights are derived from the data. Matters rarely start and end in the same spot. Some of the greatest efficiency can be gained with workflows designed for a specific case type, or that can be adapted as priorities and requirements change. Our expert review managers bring real-world experience to each project and are uniquely qualified to advise on workflows in collaboration with counsel to maximize efficiency and accuracy from start to finish. Proactive review management ensures your project stays on schedule and budget. 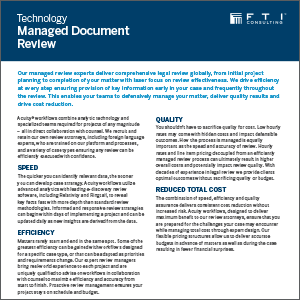 FTI staffs a core team of review attorneys that are expertly trained on the Acuity workflows. Our multi-lingual review teams are able to quickly find relevant data in multiple languages, translate inline and deliver results securely. You shouldn’t have to sacrifice quality for cost. Low hourly rates may come with hidden costs and impact defensible outcomes. How the process is managed is equally important as the speed and accuracy of review. Hourly rates and line item pricing decoupled from an efficiently managed review process can ultimately result in higher overall costs and potentially impact review quality. With decades of experience in legal review we provide clients optimal outcomes without sacrificing quality or budget. 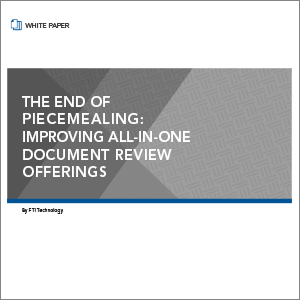 The combination of speed, efficiency and quality assurance delivers consistent cost reduction without increased risk. Acuity workflows, designed to deliver maximum benefit to our review attorneys, ensure that you are prepared for the challenges your case may encounter while managing total cost through expert design. Our flexible pricing structures allow us to deliver accurate budgets in advance of matters as well as during the case resulting in fewer financial surprises. Our review strategies and flexible workflows in unison with concept-based review have been proven to drive review efficiency. We deliver more depth than linear review across a variety of case types from investigations to Antitrust litigation and Second Requests. When you’re up against tight timelines, massive data volumes and need to deliver quality, defensible results – we can help. Can be adapted dynamically to meet the evolving demands of any matter. We recruit and retain a core team of qualified review attorneys who are experienced with a variety of case types, processes and e-discovery software platforms. Visual analytics and concept clustering unique to Ringtail e-discovery software allow reviewers to increase document review speed and move through large data sets hours, days and weeks faster than linear review tools. Eliminates the need for translation with the ability to review in native format. Flexible, transparent pricing options reduce surprises and avoid runaway costs. Reduces time spent managing multiple vendors, coordinating logistics and risks in multiple hand-offs. Real-time status reports and daily updates ensure your project stays on schedule. With offices in every major business center, FTI can deploy teams anywhere in the world in adherence with data privacy requirements. On demand delivery in North America, Europe and Asia. 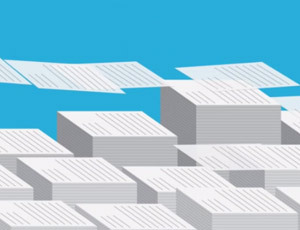 What is Integrated Document Review?